Here's another quick tip I thought I'd share. I've mentioned a few times that my feet are weird in that they are very narrow in the heels but then they are wide at the front. (Yes, like flippers.) I would find that if I laced my shoes tightly enough that my heels didn't slip too much, then there was too much pressure on the widest part of my foot, hurting the bones. 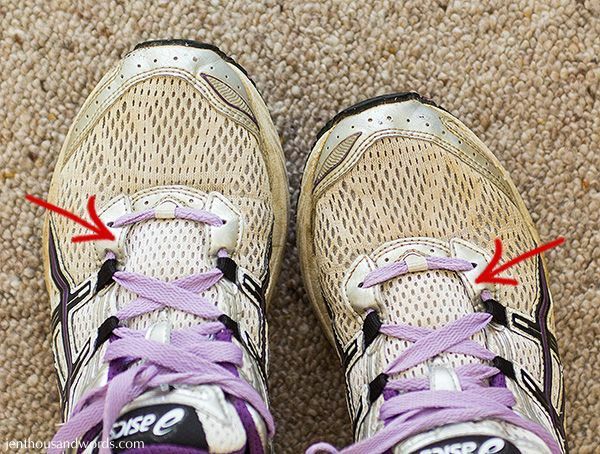 If I laced my shoes loosely at the bottom but tightly at the top then gradually it would even out and become too tight at the bottom. Then I saw this tip on Pinterest - you skip the holes at the part of your foot that you don't want pressure. By that I mean you take the shoelace straight up to the next hole, instead of across the foot to the next hole. So that is what I have done, and it makes all the difference! I can lace my shoes at tightly as I want, but it stays comfortable at the widest part of my foot. Hope this tip helps one of you.